The Environment Agency and the Kent Resilience Forum are holding a flood warden and community volunteer demonstration day in East Malling. A road in front of a row of houses which is closed due to flood waters. It will take place on Saturday 7 October 2017, from 9am to 3pm. No-one ever knows where or when the next flood will occur, but with 1 in 6 properties at risk across the UK, the public are being urged to check if their property is one of them, and do everything they can to prepare if it is. 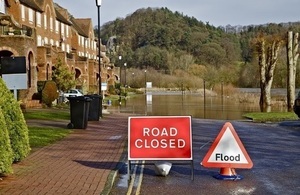 This day aims to give the people of Kent the opportunity to find ways of reducing the impact of flooding both to their homes and their communities. This event brings together the network of support organisations that exist to warn and inform people but that also provide training and infrastructure to help build robust local community plans that we action if and when it floods. This event has been designed around feedback from our volunteer community flood wardens across Kent and aims to inform and enthuse individuals and community groups about the local roles they can undertake to help be prepared. For more information or to register for this event, please e-mail krf.events@kent.fire-uk.org or via jenny.newham@environment-agency.gov.uk. For all media enquiries, please call 0800 141 2743.